Zoner Photo Studio Free is your carefree way to work and play with your pictures. Why waste time learning more than one program when just one is all you need to manage, edit, and share your photos? This program was made by avid photographers, for casual photographers who don't want to spend all day learning the program. The new Zoner Photo Studio Free is your carefree way to work and play with your pictures. The new Zoner Photo Studio Free is your carefree way to work and play with your pictures. Why waste time learning more than one program when just one is all you need to manage, edit, and share your photos? Zoner Photo Studio Free makes it easy to download your pictures, sort and organize them, find the ones you want, fix commmon problems, get creative, and then share your pictures on paper or on the Web. Zoner Photo Studio Free makes work with digital photography easy, no matter whether you took one picture or one hundred. Editing and adding effects is straightforward and painless, and gives astonishing results. 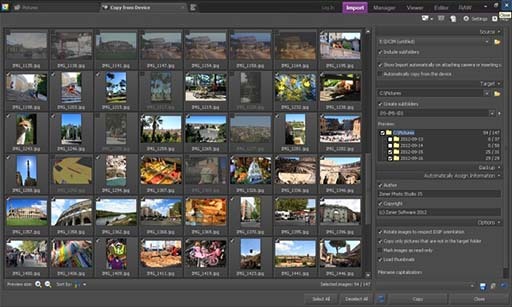 And you'll organize your photo archive simply and effectively using EXIF picture information. But your information isn't trapped inside the program! You can freely use it in any other photo program you like. You'll quickly get your bearings in Zoner Photo Studio Free and will appreciate its flexibility. This program was made by avid photographers, for casual photographers who don't want to spend all day learning the program. We know you want to spend your time taking great photos and showing them off — not just getting them ready. And Zoner Photo Studio Free makes preparing your photos quick and easy! The charcoal background saves your eyes and makes problems stand out. Once you find them, correcting them is easy, no matter whether it's red eye, blurring, or more. Or just click Quick Fix and let the computer do the work. And quick sorting is just as easy as quick fixes thanks to the Sort Pictures window. Now you've got great pictures and you want to show them off in great ways? You can, easily. With the right starting pictures, you can even easily create a 3D picture or panorama! Or just create contact sheets, calendars, greeting cards and more using one of the program's many free templates. You're free to be yourself with Zoner Photo Studio Free! The Spring Update brings you selective edits in Develop, a Refine Edge tool in the Editor, redesigned automatic edits, and many other new improvements! The Filter Brush lets you adjust only the parts of a photo that truly need it. Use it to “paint on” adjustments like contrast or exposure. And since it’s in the Develop module, every edit can be changed or reversed at any time without harming the quality of your photo! All Zoner Photo Studio Free reviews, submitted ratings and written comments become the sole property of Windows 7 download. You acknowledge that you, not windows7download, are responsible for the contents of your submission. However, windows7download reserves the right to remove or refuse to post any submission for any reason. 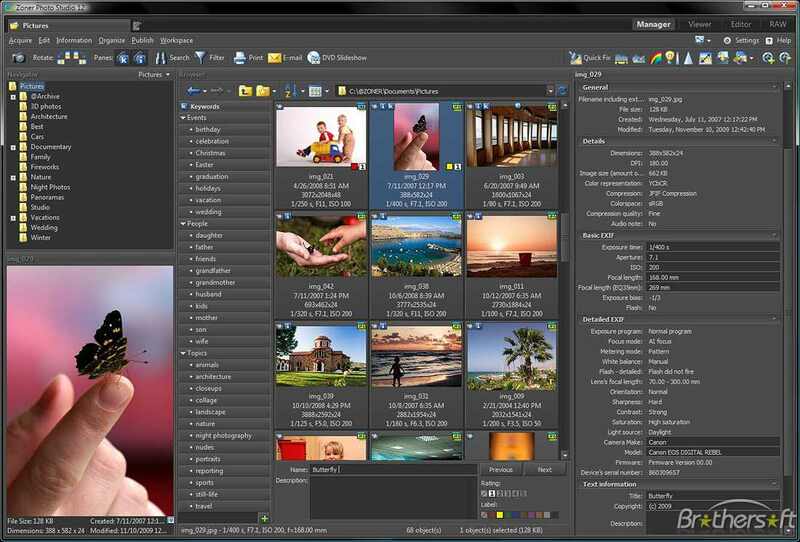 Windows 7 Download periodically updates pricing and software information of Zoner Photo Studio Free full version from the publisher, but some information may be out-of-date. You should confirm all information. Using warez version, crack, warez passwords, patches, serial numbers, registration codes, key generator, pirate key, keymaker or keygen for Zoner Photo Studio Free license key is illegal and prevent future development of Zoner Photo Studio Free. Download links are directly from our mirrors or publisher's website, Zoner Photo Studio Free torrent or shared files from free file sharing and free upload services, including Rapidshare, MegaUpload, YouSendIt, SendSpace, DepositFiles, DivShare, HellShare, HotFile, FileServe or MediaFire, are not used.